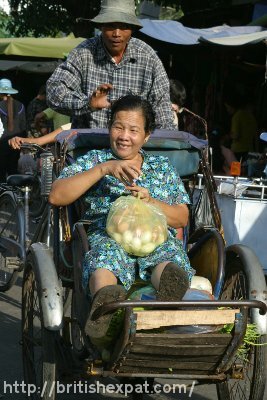 “Cambodian cyclos, like Vietnamese ones, aren’t like the cycle rickshaws found elsewhere, for instance in South Asia or Thailand. The passenger sits in front and is pushed, rather than sitting behind and being pulled. This entry was posted	on Monday 30 April 2012 at 06:16	and is filed under 2012, Cambodia. You can follow any responses to this entry through the RSS 2.0 feed. You can leave a response, or trackback from your own site.